Photography, painting, drawing, sculpture, ceramics, or mixed media accepted. On January 6 1989, the main bridge across the Macquarie River at Wellington NSW came tumbling down. The bridge was struck by a semi-trailer and when an earthmoving excavator snagged a truss on the bridge, it crashed into the Macquarie River sparking shock and panic. The driver survived the incident and a few years later a new bridge was constructed. Since that day Wellington towns people have worked hard at 'Bridging the Gap'. Not only with the construction of new bridge but addressing many social and cultural divides that many townships face in a positive and creative way. Wellington continues to embrace the diverse cultural heritages that have shaped our township, the landscape and the people of our friendly rural community as we move forward as a 'whole community'. 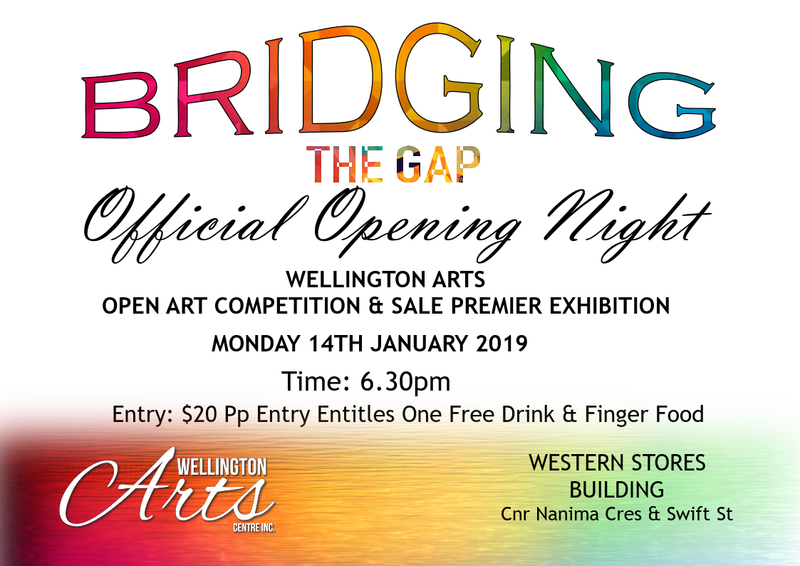 Wellington Arts invites all artists to explore the title 'Bridging the Gap' and depict what this statement means to you in todays society. $20 pp Entry entitles one free drink and finger food. Come first to view or purchase unique and sought after collected artworks donated by Peter Malcolm. All competition artworks are for sale. Winner of competition announced on the night. Tickets available in artwork raffle.